The beauty of the drive was only surpassed by the frustration of its ending. We had almost made it to Opo land. Nearly 400 people were waiting for us to come to be with them in this, the first time ever, that a believer had actually died since the Opo people, nearly all 3000 of them, had come to faith in Jesus Christ six years earlier. But there we were, blocked by the treacherous mud sinkholes hidden beneath the brown surface of the river. It was impassable by car. I stood in the rain, watching Grant, Isaac and Cherinet trying to sound out a passage through the river, astonished by the muted beauty of the water birds and lilies hiding the potential danger of crocodiles, snakes and mosquitos. “Let me go on”, begged Isaac, our Nuer priest - “it should only be a few hours walk now!” Actually, it turned out to be 7 hours of sliding through the sharp rocks hidden by the grasping mud. Isaac, cold, wet, and only 2 days into his course of medication for one of the many tropical diseases that are a part of life here, was able to connect heart to heart with these people, as he talked of the hope of those who had died in Christ, held the memorial service, and then sat under a tree all the next day and answered their many questions. We thank God for Isaac and for the beautiful Opo people. On September 4th and 5th, we hosted 34 women representing 20 distinct Mothers’ Union groups functioning out of our 14 Mission Centres spread throughout the Gambella region. It was wonderful to see how intently the women listened to the introductory story dealing with issues of how we learn and how we can work together to help take care of problems in the community. And it was a delight to see how much they enjoyed using pictures and story-telling as they later practiced teaching this to one another! They had lots of fun looking through magnifying glasses and binoculars in the session on how we are able to see things that contaminate water, and they were amazed (and quite horrified!) at the pictures of microorganisms shown to them on my computer! Our practice sessions on solar water purification, water filter construction, clean water dispensers and dish drying racks were full of laughter, good questions and good discussion. When each of the representatives left to return to their Mission Centres, they carried the materials to make their own clean water dispensers, carrying these simple, inexpensive and locally available items as if they were carrying costly treasure. These ‘water dispensers’ that our representatives will make during their own community demonstration/teaching sessions will replace the common open (and never washed) communal pot of water (which is usually kept inside the mud-walled, thatched roof church office, in the dark), and into which one unwashed cup is passed from one coughing adult to one feverish child, to another with diarrhea, etc. Our pre-project survey showed a horrifying average of 2 to 4 surviving children per an average of 9 to 11 children born into the family, most dying under age 5 from communicable disease and malaria. Some were moved to tears to think that what they are learning may save the lives of their precious children. To think that the occurrence and re-occurrence of diarrhea is something that can be taken care of and prevented was a new concept to many. To communicate these important truths in a way that is fun, non-judgmental and memorable is one of the main goals of the program. Our Mothers’ Union representatives will return to teach what they have learned by holding a teaching day for all of our 1500 Mothers’ Union members at the Mission Centres, and then by holding a second teaching day at our 70 local churches where each Mothers’ Union member is encouraged to invite and teach at least one community guest. We’ve gotten off to a great start! 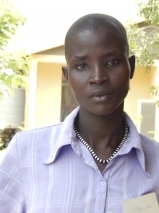 Please pray with us for Sarah Nyamuouch Kuel, daughter of our priest Peter Kuel. She was crouching down to avoid the gun fire from the cattle raiders who were attacking her village, when her life was changed in an instant by a bullet shattering her right femur. This was last December. Finally, we have the connections in place to have a surgical correction of an 9 cm loss in bone height (it would end up being about a 12-13 cm difference by the time her growth spurt ended). The marked rotational deformity and likely complete loss of nerve function to the quadriceps will make the surgical correction very complex and also a very long process. Thankfully, the Canadian orthopedic surgeon who has offered to provide this care at the lowest possible fee, is working hard with us to make Sarah's recovery a reality. Please look to God with us for His provision for this little girl. Please pray for connections to cardiac care for little Kwess, the 4 year old son of Ariet, one of our staff at the Gambella Anglican Centre. He is the size of a two year old. Suffering from a congenital heart problem, he has great difficulty breathing when he eats, and suffers from incessant recurrent respiratory infections. This type of heart defect is only correctable by surgery - an impossible dream right now for Ariet, who would have to give at least 10 year's salary for this procedure. Our priest, Michael Lual, also has a beautiful little girl, 6 years old, needing this same care. 5 Other things: Isaac Pur & David Anuk appointed to translate Gospel of Mark from Nuer to Opo; Addis-Sept 12- 27: Amharic language school; Aug 4 & 22: church visitations Bonga & Ilea; Sept 15,22,29: Services St Matthew’s Church; Sept 12-28: Addis - mountain (of red tape) climbing. And a Party apparen-t-ly Addis: Sept 27-28 Meskel - celebration of the finding of the true cross, marking the completion of one full year of service in our amazing Ethiopia! Very Interesting blog. It would be great if you can provide more details about it.